Nevada’s alliance with the Union during the Civil War was important not only for the mineral resources of the Comstock Lode but because the state held portion of the transcontinental transportation and communication lines, the California Trail and the newly constructed telegraph. After the Civil War ended in 1865, the transcontinental railroad work began. From Sacramento the Central Pacific Railroad was extended eastward over Sierra Nevada range and along the Truckee River Canyon to approach Lake’s crossing (near here). By offering land in exchange for the placement of a depot station, Myron Lake convinced railroad officials to build the main station for the Truckee Meadows near his bridge crossing. 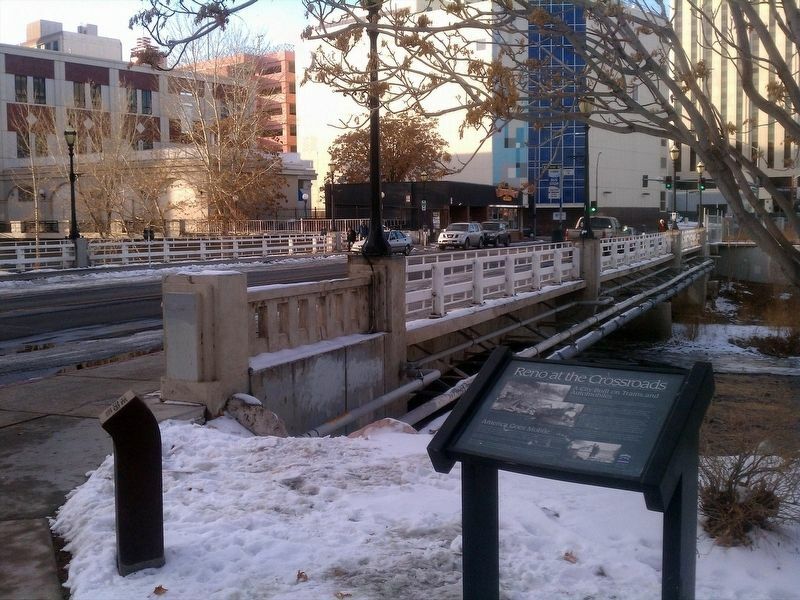 In 1868, the railroad auctioned 400 town lots and within a month more than 100 houses and businesses were established – the city of Reno was born. 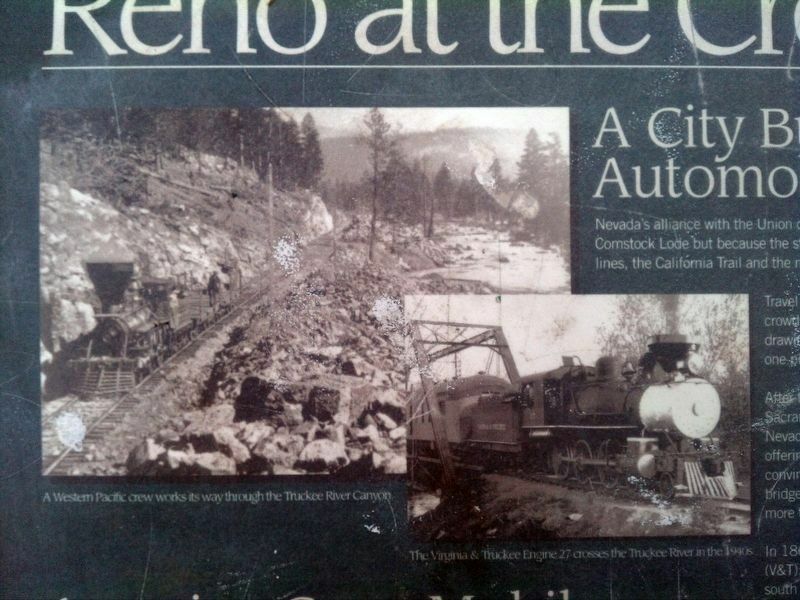 In 1869, construction started on a regional railroad, called the Virginia and Truckee (V&T); that would connect the Comstock to Reno and eventually extend its lines south to Carson City to transport products from the dairy trade from Carson Valley to Reno and on to San Francisco. country. 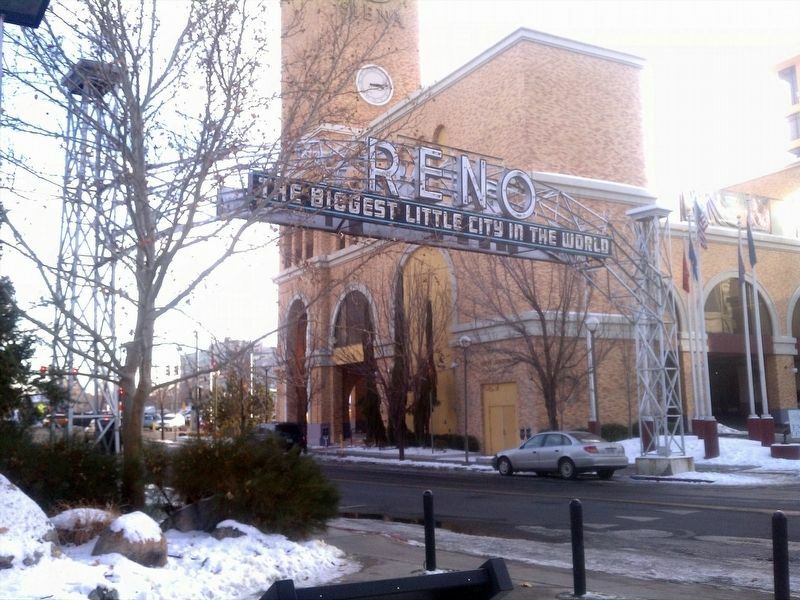 At the same time, Reno became famous for quick divorces and easy marriages. In 1913, a private consortium led by Carl G. Fisher decided to build the transcontinental Lincoln Highway from New York to San Francisco. Reno and Carson City became important junctions along the highway which would become (U.S. 50). Constructed 1925, the Victory Highway (U.S. 40) ran from Reno through the Truckee Canyon over the Sierra Nevada range and into Sacramento. Reno has served as a commercial redistribution point for Western manufacturers and distributors for the past 120 years. Today, Reno’s convenient location and transportation routes have spurred the warehousing and logistic industries, which continue to be the underlying current of economic development in the region. Erected by Nevada Historical Society. Marker series. This marker is included in the Lincoln Highwaymarker series. Location. 39° 31.553′ N, 119° 48.582′ W. Marker is in Reno, Nevada, in Washoe County. Marker is on Lake St north of Mill Street, on the right when traveling north. Touch for map. Marker is in this post office area: Reno NV 89501, United States of America. 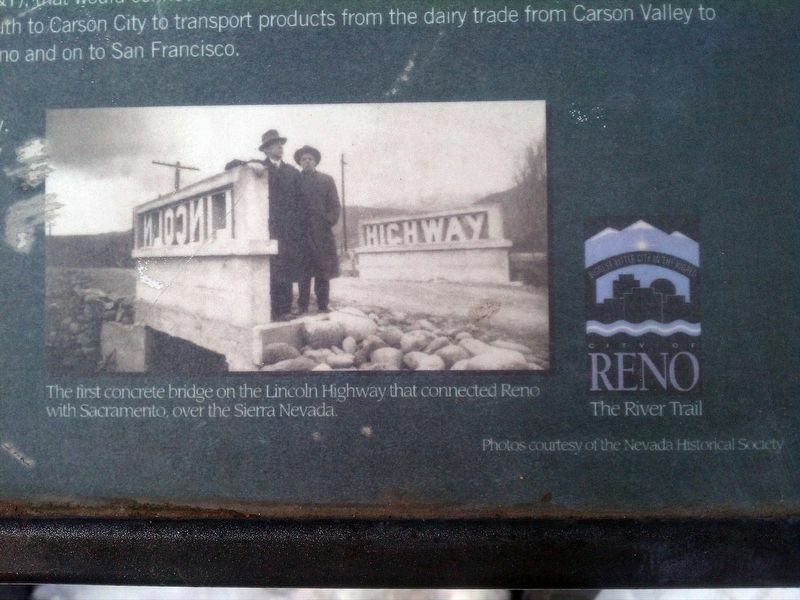 The first concrete bridge on the Lincoln Highway that connected Reno with Sacramento over the Sierra Nevada. this marker); Mizpah Hotel (about 700 feet away, measured in a direct line); Frederick Joseph DeLongechamps (approx. 0.2 miles away); Site of Nevada’s First Public Library (approx. 0.2 miles away); Lake’s Crossing (approx. 0.2 miles away); Washoe County World War II Memorial (approx. 0.2 miles away); Reno (approx. 0.2 miles away); Spanish-American War Memorial 1898-1899 (approx. 0.2 miles away). 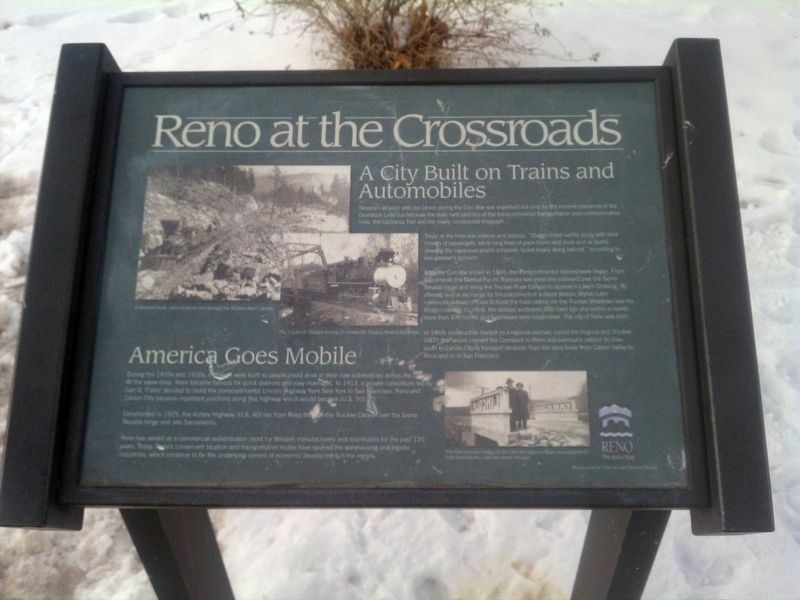 Touch for a list and map of all markers in Reno. Regarding Reno at the Crossroads. Marker located in front of the National Automobile Museum. Credits. This page was last revised on January 22, 2018. This page originally submitted on January 19, 2018, by Douglass Halvorsen of Klamath Falls, Oregon. This page has been viewed 256 times since then. Photos: 1, 2, 3, 4, 5. submitted on January 19, 2018, by Douglass Halvorsen of Klamath Falls, Oregon. • Andrew Ruppenstein was the editor who published this page.